Sri Jayadeva Institute of Cardiovascular Sciences Research, Bannerghatta Road, Bengaluru-69 invites Tender from the eligible tenderers through the e-procurement portal of Government of Karnataka for the following items on Rate Contract basis for a period of two years. Supply of Chemicals, Reagents Consumables for the department of Radiology/Generator Isotopes for Nuclear Cardiology. Supply of General items/ Housekeeping items/ Hospital Linen/ / Disinfectant items, other miscellaneous items. Supply of Furniture’s/Accessories Spares for equipment/Electrical items/Plumbing etc. Modernization of Diet Kitchen at SJICR, Bengaluru including Civil, Electrical, interior works and supply of Kitchen equipment. The tenderers can download the documents from https://eproc.karnataka.gov.in for on or after 25-05-2015 and the last date for submission of completed tenders through e-portal is 9-7-2015 up to 4-00 PM. Sri Jayadeva Institute of Cardiovascular Sciences & Research, Bannerghatta Road, Bengaluru-69 invites Tender from the eligible tenderers through the e-procurement portal of Government of Karnataka for the procurement of Medical Journals. The tenderers can download the documents from https://eproc.karnataka.gov.in on or after 17-12-2014 and the last date for submission of completed tenders through e-portal is 16-01-2015 up to 4-00 PM. Sri Jayadeva Institute of Cardiovascular Sciences & Research, Bannerghatta Road, Bengaluru-69 invites Tender from the eligible tenderers through the e-procurement portal of Government of Karnataka. Disposal of Bio-medical waste from the exit point of the premises including treatments like shredding, incinerating etc to handle all types of bio-medical waste at SJIC&R, Bengaluru & Mysuru as per bio-medical waste (management & handling) rule 1998. The tenderers can download the documents from https://eproc.karnataka.gov.in on or after 11-12-2014 and the last date for submission of completed tenders through e-portal is 09-02-2015 up to 4-00 PM. Sri Jayadeva Institute of Cardiovascular Sciences & Research, Bannerghatta Road, Bangalore-69 invites Tender from the eligible tenderers through the e-procurement portal of GOK. Establishment of laboratory with required equipment for conducting lab investigations on purchase of reagent on test basis with manpower for conducting of lab tests and issuance of reports for a period of two years at SJIC&R, Mysore Branch, Mysore. Providing software for Q-management system for OPD of SJIC&R, Bangalore. Providing canteen & dietary services at SJIC&R, Bangalore. 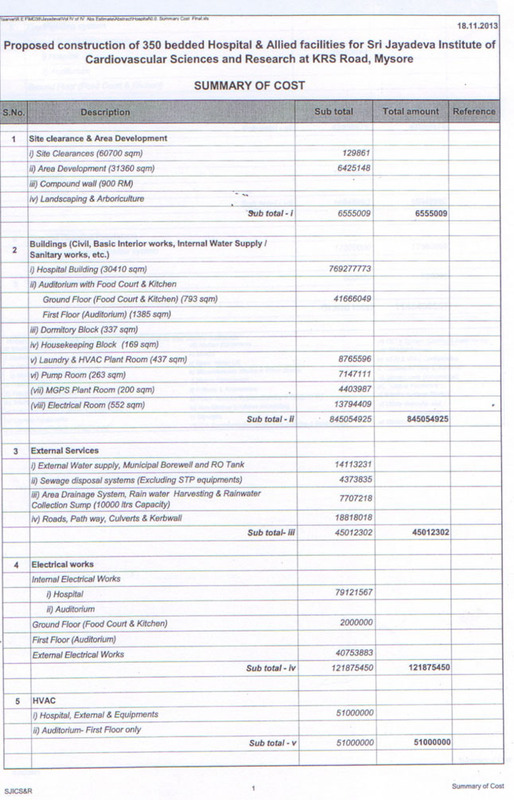 Operating Plasma Sterilizer cost per cycle basis at SJIC&R, Bangalore. The tenderers can download the documents from https://eproc.karnataka.gov.in for Sl No 1 to 5 on or after 27-09-2014 and the last date for submission of completed tenders through e-portal is 18-11-2014 up to 4-00 PM. For further details for Sl No. 6 & 7 please visit our website: www.jayadevacardiology.com. 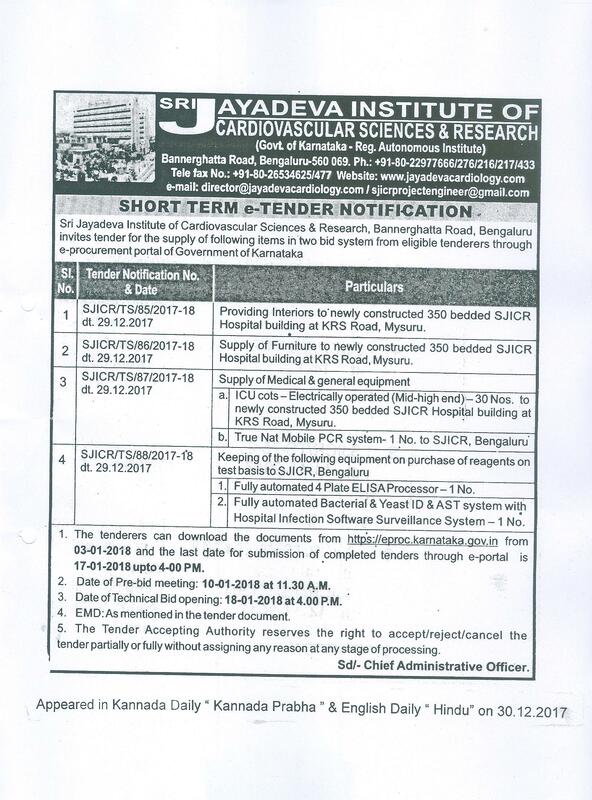 Sri Jayadeva Institute of Cardiovascular Sciences & Research, Bannerghatta Road, Bangalore-69 invites Tender from the eligible tenderers through the e-procurement portal of GOK except Sl.No.3 & 4. The tenderers can download the documents from https://eproc.karnataka.gov.in for Sl No.1 & 2 on or after 25-06-2014 and the last date for submission of completed tenders through e-portal is 24-07-2014 up to 4-00 PM. For further details for Sl No: 3 & 4 please visit our website : www.jayadevacardiology .com. Supply, installation and commissioning of Flat Panel Ceiling/Floor mounted Cath Lab. Construction of New 350 bedded hospital and allied facilities for Sri Jayadeva Institute of Cardiovascular Sciences and Research Complex at KRS Road, Mysore. Last date for uploading of Tenders by the bidders: 22-04-2014 up to 4-00 PM. 15-4-2014 up to 4-00 PM. Last date for uploading of Tenders by the bidders: 31-3-2014 up to 4-00 PM. For further details please log on to http://eproc.karnataka.gov.in. Additions & alterations work for conversion of 6th Floor North Ward Block into Semi Special Wards and Special Wards at SJICS&R, Bangalore. 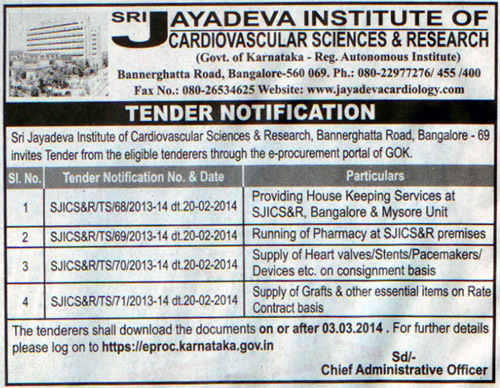 Sri Jayadeva Institute of Cardiovascular Sciences & Research, Bannerghatta Road, Bangalore-69 invites Tender from the eligible tenderers through the e-procurement portal of GOK except Sl.No.4. Phase wise procurement of Fiber Optic Bronchoscope - Adult & Paed. Sri Jayadeva Institute of Cardiovascular Sciences & Research, Bannerghatta Road, Bangalore-69 invites Tender from the eligible tenderers through the e-procurement portal of GOK except Sl.No.5 & 6. Supply, erection, testing & commissioning of 500 KVA capacity Diesel Generator Set - 1 No. 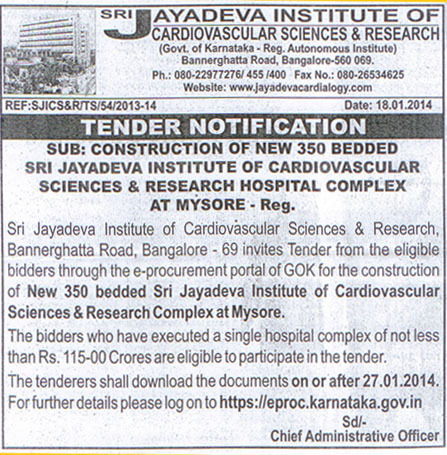 Sri Jayadeva Institute of Cardiovascular Sciences & Research, Bannerghatta Road, Bangalore-69 invites Tender from the eligible tenderers through the e-procurement portal of GOK, for Finalization of Consultants for preparation of Master plan, Architectural drawings and Landscaping for construction of new 350 bedded SJICS&R Complex at Mysore. Oscillating Saw with accessories – 2 Nos. Supply of Tissue Flotation Bath/Work Station – 1 No. 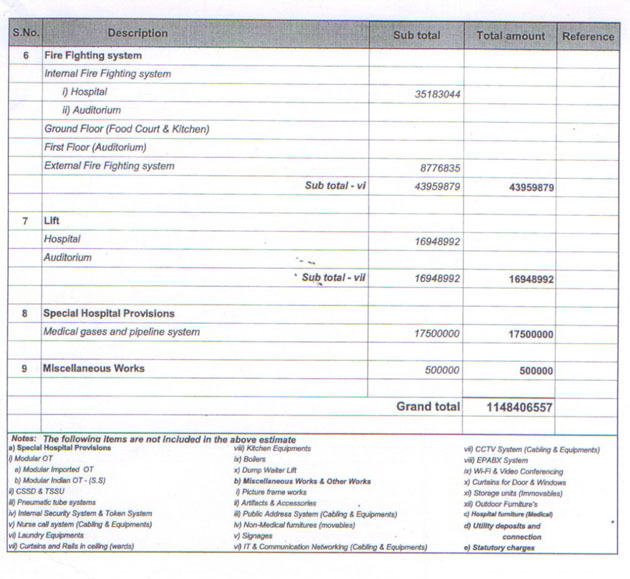 Supply, installation & commissioning of Computed Radiography System – 1 No. Computer Server – branded – 2 Nos. Annual Maintenance Contract for 750 KVA DG set – 2 Nos. Cost of the Tender Form: Non Refundable fee of Rs.2000-00 (Rupees two thousand only) in the form of D.D./cash in favour of the Director, Sri Jayadeva Institute of Cardiovascular Sciences & Research, Bannerghatta Road, Bangalore-69. Tender form has to be purchased for each item separately. The tenderers desire to have tender documents by post should send tender form fee along with extra amount of Rs. 300/- for each item by D.D. in favour of Director, SJICS&R. SJICS&R will not take any responsibility for any postal delays if any. EMD & Security Deposit: As mentioned in the tender documents. Last Date for submission of sealed tenders: On or before 9-11-2012 at 1-00 PM. Opening of Technical Bids: On 9-11-2012 at 2-30 PM in the Board Room, 1st floor, SJICS&R, Bangalore-69. The Tender Accepting Authority reserves the right to accept /reject/cancel the tender partially or fully without assigning any reason at any stage of processing.